(CNN) -- Greece's economy has been in a mostly downward spiral since the country joined the euro in 2001. While their eurozone peers had expressed their concern about the state of the Greek economy for years, it wasn't until the global financial crisis hit that the depth of the problem was revealed. Years of reckless spending and borrowing had left Greece on the verge of financial ruin by the beginning of 2010 -- not to mention in flagrant violation of inflation and deficit limits set by the European Central Bank. Despite last year's €110 billion bailout and the introduction of harsh austerity measures, the country has been unable to balance its books. European leaders' decision in mid-summer to approve a second Greek bailout package also failed to calm international lenders' fears that the cash-strapped country may default on its sovereign debt -- an outcome that would have global implications. EU Commissioner Ollie Rehn said of the situation: "A default by Greece or its exit from the eurozone would carry dramatic costs for Greece, the region and the global economy." On October 27, EU leaders got Greek bondholders to voluntarily agree to a 50% "haircut" or write-down of Greek debt -- slashing the country's debt bill by €100 billion -- as part of a three-pronged plan aimed at shoring up Greece's financial future, returning stability to Europe's banks and expanding the EFSF bailout fund's resources to more than €1 trillion. But less than a week later, Greek Prime Minister George Papandreou shocked the world by calling for a national referendum on international aid for his country -- despite already agreeing in principle to implement reforms in order to meet Greek bondholders' terms -- which, if rejected, could lead to a Greek default and the country's exit from the euro. 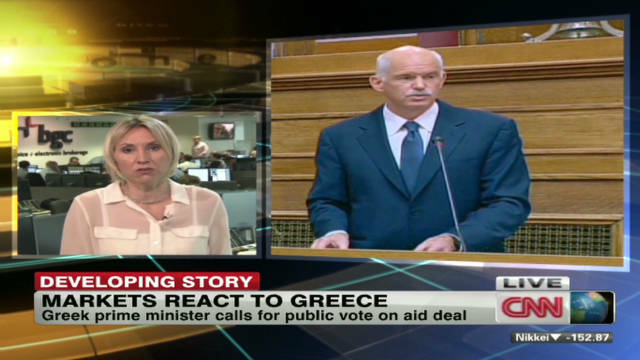 CNN takes a look at the key moments of the Greek financial crisis.